Most of the video calling solutions we've encountered in the past have either been prohibitively expensive (think video conferencing kits with price tags in the tens of thousands) or limited to software that you run on your computer. That's quickly changing—some of the biggest VoIP hardware manufacturers have already updated their lines with desk phones that incorporate video calling. Their “room telepresence” solutions are optimized for conference halls and lecture rooms, while “personal telepresence” solutions cater to individuals or small team workspaces. None of these categories have products that are particularly wallet friendly. That's always been a part of the problem with trying to get people on board with video calling. The perception is that it’s just too darn expensive, and in many cases, it's true. For small and medium-sized businesses that don’t have an enormous communications budget, these solutions often don’t make economic sense. Enter the Polycom VVX 1500. Does it break the misconception that video calling will cost you thousands of dollars? Not really. With an ~$800 dollar price tag (you can actually pick one up for much less if you shop around), this phone isn’t for everyone. Nevertheless, it is still more affordable than many of the other video conferencing hardware solutions available. The Polycom VVX 1500 is more than just a six-line enterprise desk phone. It’s a business multimedia phone, which is another way of saying that among other things, it supports video calling and business applications. Weighing in at over 5 pounds, this is easily the biggest and heaviest VoIP phone we’ve ever tested. This phone supports four video processing codecs—H.264, H.263, H.263+, and H.261—and even more audio codecs. G.722 defaults at the audio codec with the highest priority. The VVX’s design strays pretty far from the rest of the brand’s enterprise desk phones by incorporating deep black colors with metallic grays in a way that makes the device seem more refined and professional than the Polycoms we regularly use. Strapped to the back of the phone is the 7-inch touchscreen TFT-LCD. Above that is a 2 megapixel camera. Users can adjust the screen angle and even close it on the phone completely like a clamshell for storage. The camera can also be adjusted independently. The VVX’s LCD is one of the nicest ones we’ve used on a VoIP phone, and the touchscreen is definitely the most responsive. Of course a phone this price supports Polycom’s open API, allowing users to load up their phone with custom applications. The VVX 1500 also has an RJ9 headset port underneath the device next to the 10/100/1000 Ethernet port, and a USB and 3.5 mm port hidden in a compartment on the side. The phone can either be powered using Power over Ethernet (PoE) or with a 48v power supply, which you have to purchase separately. According to Polycom, the VVX can be powered at under 11w maximum using PoE. The phone has a number of settings that you can implement to save energy. For example, you can set off-hours modes and timeouts, which turn off the energy-consuming functions. It also lets you set how sensitive you want the camera to be to motion during different hours of the day so that you don’t accidentally turn the screen on when you don’t mean to. If you’re an OnSIP customer, you can use our Polycom boot server to get the latest firmware and register the VVX 1500. You can find instructions on how to do so here. Next, you’ll need the IP address of your phone. Click on the icon in the bottom right corner of your LCD. This is your main menu. 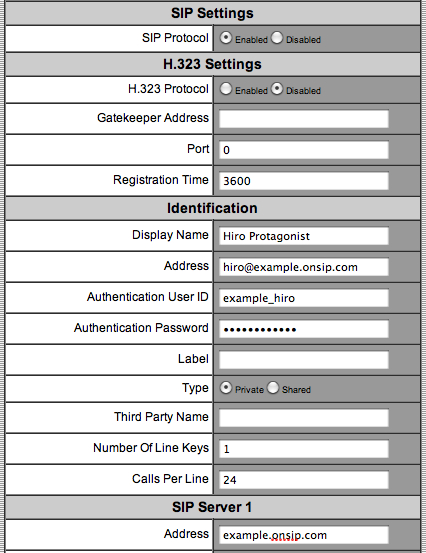 Click on “Status,” then “Platform,” then “Phone.” Note your IP address, which should be contained in the fourth line. Enter this IP address into your browser. You’ll be asked for a login and password. The default is "Polycom"/"456." Select “lines” in the top navigation of this page. You should see links to the six lines you can configure on our VVX. Click on “Line 1” and enter in your user credentials as shown. Next click on “SIP” in the top navigation bar of the page. Under “Servers” > “Outbound Proxy,” type “sip.onsip.com” into the address field if you are an OnSIP customer. Hit the “Submit” button at the bottom of the page. This covers basic account setup. There are many more settings you can tinker with in the Polycom web portal. The Polycom VVX 1500 passed our test cases with no issues. 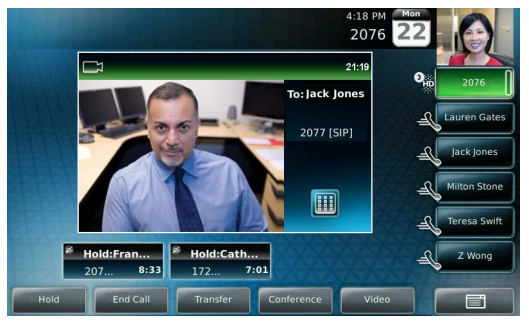 We tested video calling on the Polycom VVX with several other devices and softphone solutions. We started off with another VVX. As expected, video calls went through without a hitch using H.263 and H.264. Call quality was excellent. Video calls negotiated using H.264 were noticeably better in quality, even on the 7-inch screens. Next we tried video calling between the VVX 1500 and Counterpath’s Bria softphone. The Bria did not receive any video when we tried using H.264 and H.263+, but we were able to get the video call working properly both ways using H.263. We ran into the same issue when testing the VVX 1500 with the new Grandstream GXV3175 and the free open-source SIP client, SIP communicator. For now, H.263 seems to be the only codec that will work across the board. Call quality is something that we’ve never had a problem with on Polycom phones and the Polycom VVX 1500 is certainly no exception. HD calls on the VVX 1500 sound fantastic—it’s more of the great “it sounds like you’re in the room with me” experience we’ve grown accustomed to with Polycom hardware. Keep in mind that you will only get wideband audio on SIP calls when both callers are using devices or software solutions that support the same wideband codec. The speakerphone on the VVX 1500 is superb. We would even go so far as to say that it is on par with the speakerphones on the dedicated conferencing solutions in Polycom’s Soundstation series. Unlike other Polycoms, the VVX 1500 has an adjustable stand, which allows you to set the tilt angle of the phone. The phone stands very tall but takes up the least amount of room on your desk when you set the stand high. With an adjustable screen angle, a camera that you can tilt up or down independently of everything else, and an adjustable stand, you should have no trouble finding the perfect camera angle for video calls. The hard keys on this phone are very nice. These metallic-looking buttons are much bigger than the ones you find on other Polycom desk phones. Several of these buttons have LED indicators inside that light up when the matching function is active. You’ll find a clearly labeled button for nearly everything. 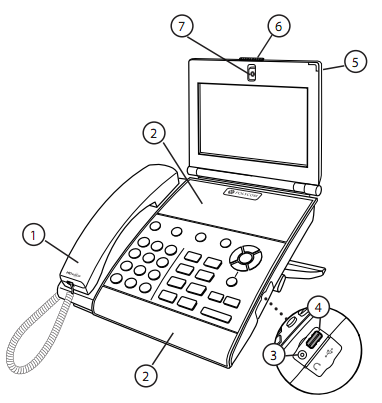 Of course there is also a dial pad, and a navigation wheel just like you’d find on Polycom Soundpoint phones. It behaves exactly the same: hitting the left arrow brings up received calls, hitting the down arrow brings up missed calls, hitting the right arrow brings up placed calls, and hitting the up arrow brings up your speed dial information. As we mentioned before, the touchscreen is very responsive. The “New Call” button at the bottom left-hand corner of your screen automatically uses your first SIP account. If you have numerous active SIP accounts, you’ll find them lined up in a column to the right. Tap on any of these accounts to make a call with them and the VVX 1500 will bring up a touchscreen dial pad. You also have the option to dial using SIP addresses. Simply tap the “URL” button. The button in the bottom right-hand corner of your screen takes you to your main menu. Note that there’s also a hard key on the phone to get you there. You have four main options here: Features, Status, Settings, and Applications. We prefer navigating through these menus using the keys on the navigation wheel because the touchscreen scroll bar can be frustrating to use. 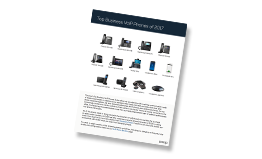 If you’ve ever used a Polycom desk phone before, then you’re probably already familiar with the options in Features, Status, and Settings. Features allows you to set call forwarding rules, add contacts to your directory, see your call lists, access your message center, etc. You can also access your USB device here to browse your recorded calls and upload pictures to the phone. Support for some of these optional features depends on your system. Going into Status lets you get information about the platform, network settings, line status, etc. New here is the Diagnostics option, which allows you to test your hardware (for example, touchscreen and audio diagnostics) and view graphs that show CPU load, network load, and memory usage. Settings is just what it sounds like. If you don’t happen to have a computer around to access Polycom’s web portal, you can set up and customize everything right from the phone. The last option is Applications. Our VVX 1500s did not come with the Polycom Productivity Suite or any XML application presets, which will probably be the case for most people. We were able to quickly test the microbrowser feature by simply going into the Polycom Web Portal > General > Microbrowser and typing in random URLs into the fields “Main Browser Home” and “Idle Display Home.” Note that this is probably not what Polycom had in mind with the microbrowser. Ideally, you or your company would build a customized page that’s optimized for your business. If you’re planning on using this feature to freely browse the Internet, you’ll probably be a bit disappointed with the overall performance. Load times are a little on the long side. As you might expect, the experience picks up when you're on pages that are optimized for phone browsers, like m.google.com; just don’t expect to be streaming YouTube videos on this thing. If this phone were a couple of hundred dollars cheaper, we would be telling everybody to pick one up, even if they weren't going to regularly use video calling. The Polycom VVX 1500 combines all the highs from the enterprise phones in the Soundpoint series with one of the best touchscreen LCDs we've tested on a VoIP phone, as well as an impressive range of video interoperability opportunities. Call quality is superb, and the speakerphone is a cut above the rest. With business XML applications, you can go as far as your IT department is willing to take it. Unfortunately, the Polycom VVX 1500 is not $400. At its current price point ($683 on Telephony Depot), whether or not this phone is worth the money really depends on the way your business operates. Do you make use of video conferencing solutions regularly? If so, getting one of these for your off-site executives or employees might make sense. If your business happens to be a small mom and pop shop with camera-shy employees, then maybe pass on this one. To be honest, the Polycom VVX 1500 doesn't even make much sense for us since we don't conduct video conferences outside of hardware and software testing. Who knows though—if we distributed a few video phones to our remote employees, we might just start. For further reading on the Polycom VVX 1500, check out this great review by Michael Graves. Images used in this review are from the Polycom marketing site and Polycom user manuals.